There are a few things you should know before you attempt to paint your wood deck. Painting a wood deck or fence can truly make it beautiful, but this can also be difficult to maintain in the face of environmental stressors and everyday wear. Unlike wood siding, wood decks, handrails, retaining walls, fences, and other more complex structures expose multiple sides of each piece of wood to the elements. Some of these surfaces are inaccessible and difficult to protect, which makes it difficult to achieve a complete waterproof membrane or thoroughly painted appearance. 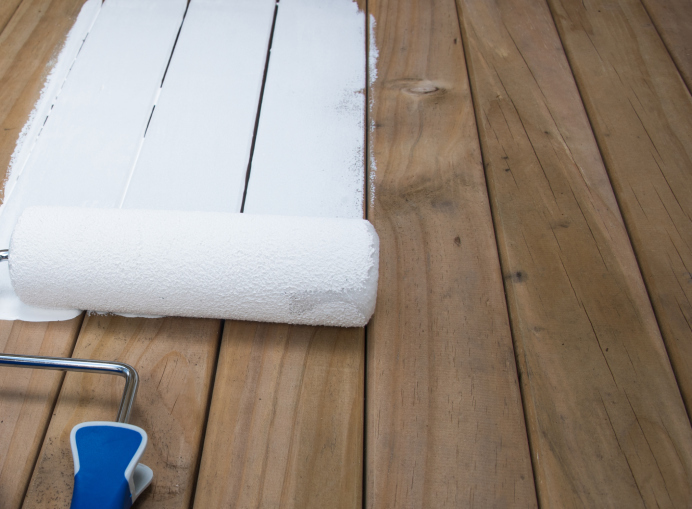 Read on to discover important tips for preparing and painting your wood deck. Partially painted wood is vulnerable to both water damage and damage from water vapors from all sides, causing the painted sides to lose their integrity. This means that even the painted sides can no longer protect the wood. Don’t paint unless you can cover all six sides of every piece of wood. In situations where you can’t reach between pieces of wood which are sandwiched together, caulk them as thoroughly as possible. Make sure the wood is cleaned as thoroughly as possible. Don’t be afraid to pressure wash, sand, and utilize detergent scrubbing. Dirty wood will make painting difficult and give your wood deck a very unprofessional finish. The larger nail will have an as-good-as-new grip and hold loosened wood tightly in place. Countersink all nails and fill the resultant hole with a high-quality, exterior-grade putty. While applying the putty, make sure to conscientiously remove any excess. This will keep sanding to a minimum, and make painting your wood deck a breeze. If your wood deck has previously been finished with a high-grade, oil-based finish, do not paint over it. Painting over a previously oiled surface will cause disastrous results, and a mess that will be time consuming and almost impossible to correct. Do you need some great Benjamin Moore paint to get started on your painting projects this fall? Columbia Paint Company is your one-stop shop for all of your home-decorating needs. From fabulous Hunter Douglass window treatments to beautiful Benjamin Moore paint products, we have everything you need to make your dream home design a reality.Schedule an appointment with one of our design consultants today! Don’t forget to check us out on Facebook, Twitter, Pinterest, and Google+for more updates, information, and tips!